A couple days ago the folks at the Transformers Collectors Club teamed up with Seibertron.com to reveal their upcoming G.I. 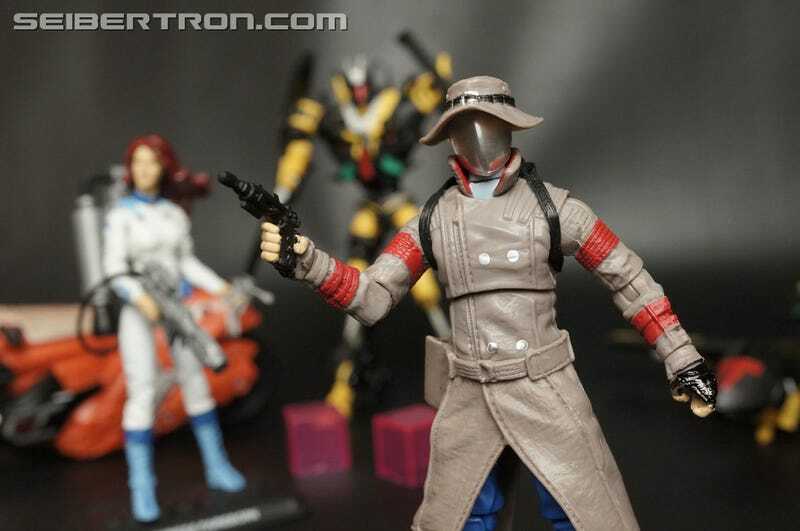 Joe crossover set featuring a character called ”Old Snake.” He’s an actual character from an actual Transformers cartoon. A very silly Transformers cartoon. While the third season episode “Only Human” never specifically refers to him as Cobra Commander, there’s no mistaking the faceplate, the raspy voice and the choked-out battle cry the ancient terrorist leader lets out at the end of one of the stupidest evil plots ever hatched in a Transformers cartoon. Completely memorable human villain Victor Drath, tired of the Transformers’ constant thwarting of his evil schemes, enlists the aid of a retired terrorist leader in building a machine that will swap the minds of Ultra Magnus, Spring, Arcess and Rodimus Prime into humans, after which he will destroy their robot bodies. Why not just destroy the robots with their minds intact? Because then we wouldn’t get to see color-coded space jumpsuits. It bears mentioning that this cartoon, released in 1986, depicts Earth in the year 2006. I am still incredibly disappointed that I don’t own one of these outfits. Where are my white space boots? It’s an incredibly strange episode. Rodimus Prime goes through Matrix withdraw—I guess technically he’s just Hot Rod without it? The human Springer rides inside the robot body of Springer, as Old Snake convinced Drath to keep the bodies intact in order to commit crimes—lucky that. Also, no one talks about having to eat and poop, which was pretty disappointing to 13-year-old me. In the end, Perceptor manages to reverse the process, placing the robot minds back in the robots and leaving the human bodies lifeless husks. Maybe some other humans ate them. I don’t know. The Transformers Collectors Club set will come with “Old Snake” himself, as well as a pair of Transformers Prime Soundwave figures redecorated to resemble G.I. Joe’s Battle Android Troopers (B.A.T.S.). Head over to Seibertron.com for many more pictures of the amazing set. It should go nicely with TFCC’s other crossover set, starring the daughter of two of G.I. Joe’s finest.